If you've scrolled through your Instagram feed lately, you've likely seen some photos and videos of beautiful hand lettering and calligraphy. Not only are these videos impressive, but many people find them soothing. There's something about the sound of feather quill pens scraping against parchment scroll paper that appeals to people. While these videos are surely impressive, there's nothing that keeps you from trying handlettering yourself. Many of these people are self-taught. With just a bit of practice, you may find yourself with a new skill or hobby -- one you could even put to use this holiday season. As humans, we are hardwired to enjoy learning and problem solving. Handwriting and calligraphy are mentally stimulating for some people. Even if you don't think of yourself as the creative type, calligraphy is a perfect way to nurture your creative skills using templates and guides. Homemade gifts always mean a lot to the recipient. Imagine the look on your loved one's face when they receive a card or poster that you've created using your new skill. It's likely that they'll be inclined to keep the gift for a long time, and even put it on display. You can even use your own handwriting as a template to have a three-letter monogram embroidered on an article of clothing, luggage, or towel. From invitations and place cards, to thank you notes and holiday letters, handwritten pieces are much more personal and can look amazing if done well. If you're planning a holiday party this season, or even a wedding, banquet, or other event in the future, you can use your newfound calligraphy skills to create personalized, intricate designs to wow the guests. 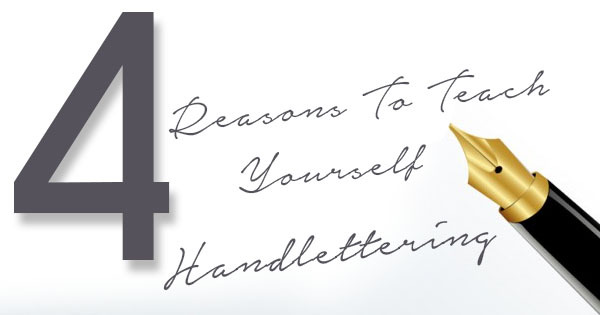 Yes, even though the handlettering phenomenon has proven to be relaxing for viewers, it can also be soothing for the artist. If you find drawing or coloring a soothing activity, you may want to try your hand at calligraphy. Try writing inspirational messages to yourself. Display them around your work space or work on them until you've perfected the craft. All you need to do so is some ink and quills and a piece of thick paper. For the holidays, it may be worth putting scroll invitation paper and a feather quill pen on your wish list. To make your loved one's job easier, send them to Nostalgic Impressions.